HENRYVILLE, Ind. (July 2005)  When the helicopters first circled to get a better view of Dave Daughertys elaborate gardens, he hardly took notice. But when they kept coming back, he decided it was time to open the doors to the public. The Louisville Courier-Journal ran a feature on Daughertys project in October 2002, giving the public its first in-depth look at Cathedral Gardens. The photos were too enticing. People wanted in. There were phone calls, helicopters. We couldnt believe it, he admitted. Daugherty, 69, purchased 52 acres of land in Henryville in 1993, hoping to build a cabin there for himself and his wife. The successful Louisville engineer and software developer was anticipating retirement and thought the plot would allow him the space necessary to unwind and pursue his creative interests. The story of Daughertys career is a happy one. While he reluctantly turned down a music scholarship for a more practical engineering degree, his decision paid off. Daugherty joined the Army Corps of Engineers in the 1960s to build dams along the Ohio River before working for local government consulting with property developers and overseeing drainage installations. He eventually started EAS Technologies, an innovator in labor management systems. At EAS in the 1980s, Daugherty pioneered one of the first automated payroll systems. Daugherty contracted his services and software to large businesses, including Kroger, Mercedes and the Pentagon, as well as international corporations. He sold out in the mid 1990s to Minneapolis-based Ceridian, a company specializing in human resources and payroll management. This allowed him the time and money his masterpiece would require. Retirement proved too idle for Daugherty, and he was soon toiling away on his new property. He built his cabin, and the work has not stopped since. He put his engineering experience to work, draining, damming and sculpting what was once a marshy dumping ground. Daugherty soon found that his land was rich in resources. He unearthed a creek bed lined with brownstone, which he used to handcraft a series of retaining walls and terraces. With his land drained, he set about gardening. Ive built 12 separate gardens, one at a time, said Daugherty. Eventually, he added three full-time employees to help construct and maintain his landscapes. Daugherty named his property Cathedral Gardens to reflect the spiritual aspects of his work. Faith was influential in the construction of the gardens, a fact evident in the religious-themed sculpture and verse that ornament the grounds. Each garden utilizes a different theme. 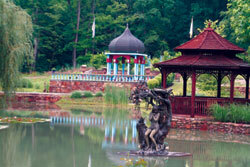 China Bay features a pagoda and eastern influenced design, while Saracens Retreat includes a Moorish-styled shelter and colonnade that evoke southeastern Spanish architecture. Greek Garden infuses imagery from classical Greece with lush vegetation. Christs Garden, which Daugherty built in 2000, overlooks the other areas. A fountain in the shape of the cross sits at the center of the garden. The latest addition is a parcel of land surrounded by a Venice-inspired canal. Still a work in progress, the Venetian Garden will include a pavilion with seating for 200, where visitors can watch live performances of music and dance. Daugherty conceded to demand in 2003 and began admitting visitors but only began advertising last year. 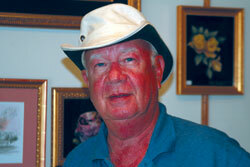 Bob McAdams, director of the Scott County Visitors Commission, is one of those wowed by Daugherty and his works. Its one of the most spectacular things in the state, said McAdams, who has recently come to know Daugherty personally. Cathedral Gardens played host to 2,500 visitors in 2004, and Daugherty is hoping to bring in 7,000 this season, which runs May to October. Admission is $12. Daugherty personally leads tours, which depart at 9 a.m., 11 a.m. 1 p.m., 3 p.m. (EDT-fast time). Each section of the Gardens is fully accessible, and visitors may choose to walk the tour or enjoy the sights from one of two golf cart limousines. In July, visitors will enjoy the blossoming hydrangeas and dahlias. The dozen varieties of pastel waterlillies will also be out in full force. Site-grown plants are sometimes available for purchase. Cathedral Gardens also began hosting weddings in 2003, and Daugherty expects the opening of the Venetian Garden to expand capacity for weddings from 60 to about 200 guests. In June, Daugherty witnessed another first  a man proposed to his bride at Christs Garden. Fortunately, she accepted, he laughed. Daugherty was reluctant to open his private sanctuary to the public but has been overwhelmed with the quality of visitors. A large percentage of people are deeply moved by their experience here, he said.  For more information on Cathedral Gardens, visit www.cathedralgardens.com or call (812) 294-3193.